The most exciting development this week is that the cabinets have started to go in in the back bathroom. Construction is all about sequences, and because of the modern design of the back bathroom, with smooth surfaces that all tie together, the cabinets needed to go in so that the countertop could be installed, so that the shower glass could be installed to bury into that countertop, so that the tile could go in against that glass. So this is what it looked like when I peeped in there this weekend. 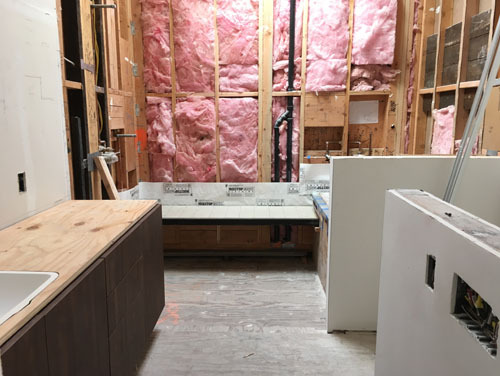 You can see the shower bench and the sink basin in place, as well. I didn't do a double vanity for a few reasons: 1. I absolutely do not need to share anything I do over a sink with anybody else. 2. You never have enough space on the countertop for things you actually need the countertop for, like laying out a makeup case, or some exciting tooth-cleaning gadget, or just having space for a vase of flowers. 3. Sinks use a lot of space under the counter, too, and I find there is never enough storage in the bathroom, especially for bulky things like towels. The cabinets are Crystal Cabinets Como Synchro, which is an Italian-made laminate that is laser-fused to the base. That makes it super-durable and suitable for locations like a bathroom where things are going to get a lot more moisture. It's a man-made material so there's no grain-matching, but I wasn't actually interested in that, because I like the kind of chaotic look. 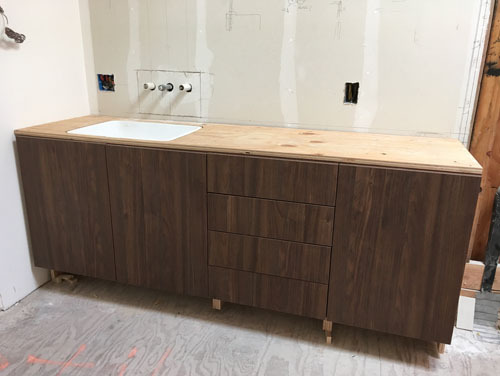 So I got a finish much like a walnut veneer, but without the potential for trouble that a walnut veneer can give in a bathroom. As a disclaimer, my firm sells Crystal Cabinets so I got the employee discount on these. I'm pretty sure I didn't already show you the shower bench, too. This will just be a simple slab bench, suspended over the linear drain. That takes a lot of scrutiny off the drain, and since we already kind of splashed out on a more visible drain in the middle bathroom it seemed like a great idea to go a little less pricey on this one. 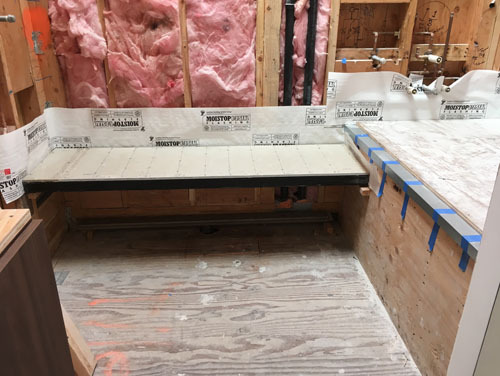 The bench will be covered in the same countertop material as the vanity. 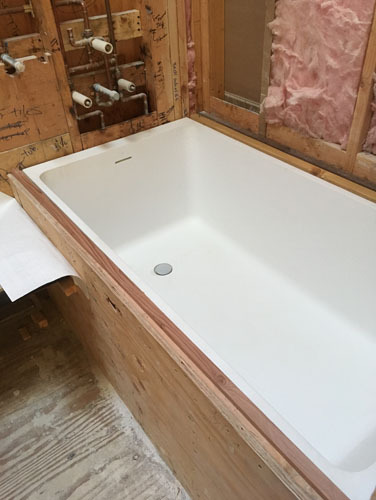 And here's the tub in place, again. There will be a countertop here, as well, which makes the waterproofing work better (we can just run it up the little narrow wall next to the tub, there, and end it at the underside of the countertop). My original idea was to have the tub exposed, but that would have been a lot more work for not a huge payoff. All I could think was that the guys who spent a week making those walls perfectly flat were going to throw a fit when they saw that. 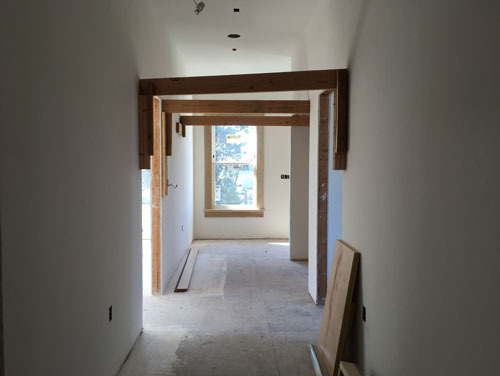 I think it's to control the hydronic tubing as it is being installed. Let's see, shall we?